In loving memory of our dear boy. 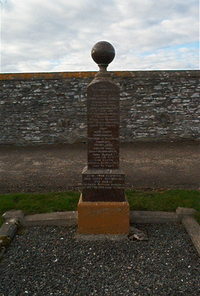 John Adam Barnie of Achorn Dunbeath died 11th July 1900 in infancy. Brother Private George Barnie 7th Seaforths killed in Belgium 28th September 1918 aged 24. Jane Scott Cunningham died at Ballaghly Dunbeath 9th October 1923 aged 59. Husband John Barnie died 28th May 1954 aged 89. Daughter Jane Scott Sutherland died at Freswick Cottage Dunbeath 3rd February 1965 aged 77.